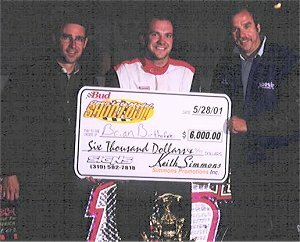 WEST LIBERTY, Iowa (May 28, 2001) - Brian Birkhofer ended Steve Boley�s 2001 stranglehold in Budweiser Open Late Model Shootout action at the West Liberty Raceway on Monday, May 28. Birkhofer used three caution flags and the double file restarts to take the lead late in the 50-lap race after earning a 22nd starting position via winning the second consolation event. 60 Late Models signed in to battle for the $6,000 top prize, putting a premium on heat race finishes and passing points earned. 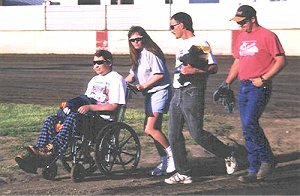 Boley, perfect in 2001 by virtue of leading every single lap during the three Open Shootouts held so far this year, was the odds-on favorite to defend his 2000 West Liberty Open Shootout victory at the drop of the green flag, taking the lead away from pole sitter Denny Eckrich in the first corner and running away from the field. Boley�s hot pace put him in lapped traffic just ten laps after the event�s first yellow flag on lap four with a full straightaway cushion between himself and the rest of the pack. Unfortunately, Boley brought out the next caution himself on lap nineteen when a rare miscue caused him to jump the turn four cushion and coast to a stop. Boley was able to resume and rejoined the race at the rear of the field, handing Skip Frey and Gary Webb the front row for the restart. Frey attacked the bottom of the racetrack with Webb on the cushion when racing resumed as the two raced door handle to door handle until encountering lapped traffic during the 34th circuit. Frey found the easier way through the traffic, opening up a sizable lead until caution slowed the pace for the final time on lap 38. With Frey at the point, Birkhofer lined up in the fifth position on the restart, with 20th place starter Rick Wendling behind him in seventh. Webb got the jump on Frey as the green flag replaced the yellow, and quickly moved his car down to the bottom of the track to protect his lead. Birkhofer and Wendling used the opening to motor around the top of the racetrack, first challenging the leaders on lap 42. Two laps later Birkhofer took the point and began stretching his lead as Webb and Frey�s attention turned to Wendling. Splitting the cars, Wendling took the third spot away from Webb with three laps to go, shooting past Frey for second a lap later. Boley used a strong run through traffic on the final restart to nab the fourth spot away from Webb on the white flag lap. Ray Guss Jr advanced from seventeenth on the start to take home the sixth spot, ahead of Jeff Aikey, Darren Miller, Kyle Berck and Mike Klinkkammer. Chuck Mayerhofer parlayed his pole position into a victory in the ten-car, ten-lap Non-Qualifier Dash for Cash ahead of Jeff Bair, Monte Ohrt and Chris Smyser; while Pro Stock action saw Matt Gilchrist take the lead after a lap thirteen restart erased John Maher�s huge lead. Maher held on for second ahead of Andy Eckrich, Chris Simpson and Rusty Daufeldt. Regular NASCAR Weekly Racing Series action returns this Saturday, June 2nd. Plenty of top drivers will try to keep the streak of 6 different Late Model winners in six weeks alive as several top runners including Ray Guss Jr, Rick Wendling and Gary Webb have yet to notch a victory on the flat half-mile in 2001. Hot Laps are scheduled for 6:30 pm with racing action to follow. For more information contact Simmons Promotions at 563-744-3620 or online at www.simmonspromotionsinc.com. 6. 12 Ray Guss Jr., Milan, Ill.
8. 32d Darren Miller, Chadwick, Ill.
9. 14 Kyle Berck, Marquette, Neb. 24. 8 Sonny Findling, Kirksville, Mo. 1. 8 Chuck Mayehofer, Dixon, Ill.
4. 25s Chris Smyser, Lancaster, Mo. 7. 87 Clint Hines, Taylor Ridge, Ill.
9. 07 Scott Heeren, Forreston, Ill.
10. 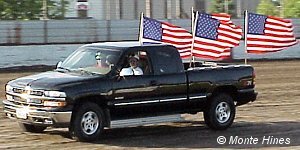 26b Wayne Brau, Annawan, Ill.
ez33 Nick Marolf, Moscow, Ill.
37b Troy Bruder, Rock Falls, Ill.
11 Steve "Ace" Ihm, Hazel Green, Wis.
11. 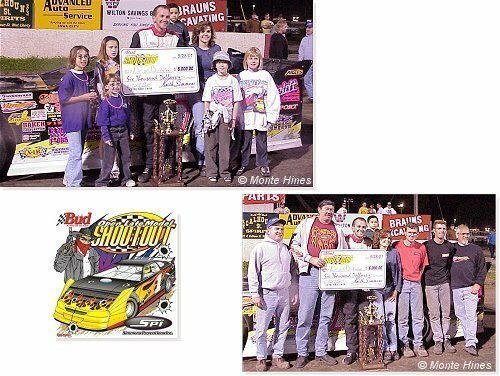 16 Dan Shelliam, Hazel Green, Wis.
Brian Birkhofer celebrates Bud OLMS $6,000 win with family and crew!